Vinyl and enamel paint mural. Commissioned by the Queens Museum. For this work, one of my inspirations was the Queens Museum’s Panorama of the City of New York, which so starkly displays the many interlocking grids that organize the city. Using the crosshatch from a fabric that has recurred in my work, I use the grid motif here to structure and intercede in a collaged landscape. The image combines elements of paper and photo collage to evoke the natural environment of Queens and greater New York State. The juxtaposition of geometry with landscape reflects a characteristic I consider essential to New York City. Drawing from my collection of natural imagery from the five boroughs, this mural advances my investigation of collage’s potential to represent specific locations and communities. Landscape and collage have long been crucial components of my oeuvre, serving both to refer formally to artists who have influenced my work and to activate the re-contextualization and re-evaluation of artistic tradition that I aim for. 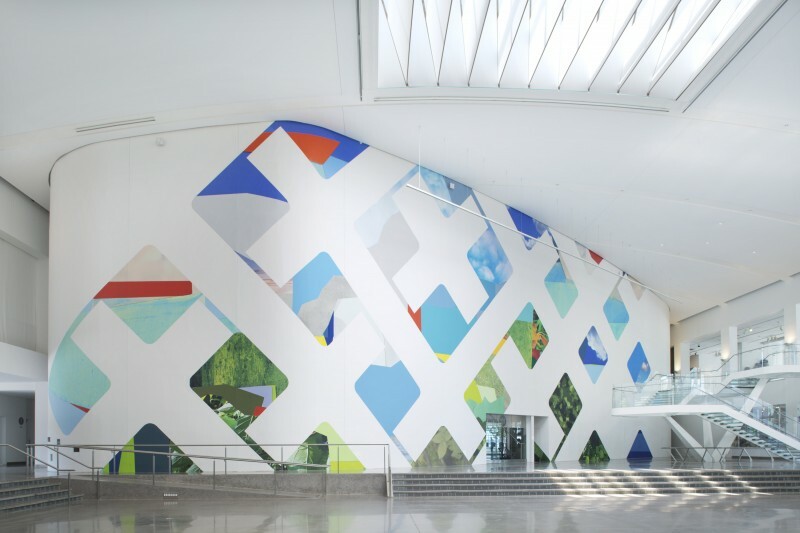 Both are central to the large-scale installations I have designed, including Untitled (2012) in the Barclays Center, Brooklyn; Faux Real (2013) in the Norton Museum, West Palm Beach; a mural currently in production for the United States Embassy in Dakar, Senegal; and a mosaic recently selected by the Los Angeles County Metropolitan Transportation Authority for a station on its new Crenshaw/LAX Corridor. Best known for her elaborate paintings composed of rhinestones, acrylic and enamel, New York based artist Thomas introduces a complex vision of what it means to be a woman and expands common definitions of beauty. Her work stems from her long study of art history and the classical genres of portraiture, landscape, and still life. Inspired by various sources that range from the 19th Century Hudson River School to Edouard Manet, Henri Matisse and Romare Bearden, she continues to explore notions of beauty from a contemporary perspective infused with the more recent influences of popular culture and pop art. This project is made possible by the visionary support of Rena and Scott Hoffman, Ann Tenenbaum and Thomas H. Lee, Ferriday Fund Charitable Trust, Victoria Rogers, Kimberly and Tord Stallvik, and other generous donors.